"Minutes - that’s all it takes to change your entire life. 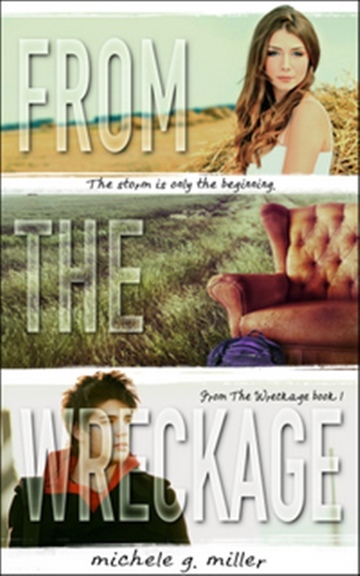 How do you deal with that?” For high school senior Jules Blacklin surviving the storm is only the beginning. Faced with the new reality of her life, she must find a way to rise From The Wreckage and answer the question - how do you get back to normal, when everything that was normal is gone? Michele writes novels with fairytale love for everyday life. Romance is always central to her plots where the genres range from Coming of Age Fantasy and Drama to New Adult Romantic Suspense.Accolades: Never Let You Fall - Best Debut Nominee-UTopYACon 2014Last Call - Best Romance Series Nominee-UTopYACon 2014Never Let You Go - Best Cover Nominee-Penned Con 2014Skye and Xander, The Prophecy of Tyalbrook series - Best Fantasy Couple Nominee-Penned Con 2014Having grown up in both the cold, quiet town of Topsham, Maine and the steamy, southern hospitality of Mobile, Alabama, Michele is something of an enigma. She is an avid Yankees fan, loves New England, being outdoors and misses snow. However she thinks southern boys are hotter, Alabama football is the only REAL football out there and sweet tea is the best thing this side of heaven and her children's laughter! Her family, an amazing husband and three awesome kids, have planted their roots in the middle of Michele's two childhood homes in Charlotte, North Carolina.